The Tourism Confucius Institute is the world’s first and only Confucius Institute with an emphasis on tourism. We offer a range of exciting short courses for government, industry and the wider community to promote Chinese learning, as well as a better understanding of Chinese people and their culture. Whether you are a beginner, intermediate or advanced learner, you can choose from our popular courses, including General Chinese, Tourism Chinese and Business Chinese. Griffith staff and postgraduate students can enrol in any scheduled Tourism Confucius Institute Group course free of charge. Contact us to register. We also offer after-school classes, programs for school students and test preparation workshops for Chinese proficiency exams. Our courses help promote Chinese culture and language through education. China has one of the world’s oldest and most fascinating cultures. In order to provide people with a better understanding of the country, we host a range of cultural programs for schools, university students, industry and the wider community. 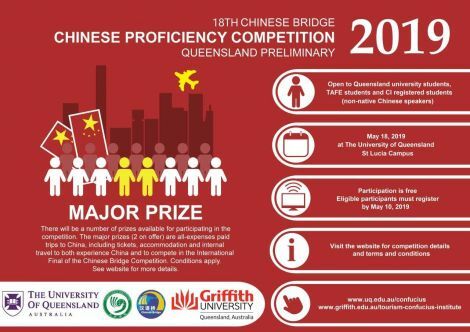 Join us at the 18th Chinese Bridge Chinese Proficiency Competition on 18 May 2019 at the University of Queensland's St Lucia campus. Compete for a range of prizes and awards through Mandarin language and cultural knowledge. Competition overall winners will receive sponsored travel to China to compete in the International Chinese Bridge Final! Our group Chinese language classes began meeting on 25 February 2019. Registration for Term 1 2019 is now closed, but there still may be space in some of the classes. Private lessons are also available at any time upon request. For questions regarding our courses please contact Ms Shuang Wu for Nathan classes and Mr Frank Fang for Gold Coast classes. The Nathan Campus and the Gold Coast Chinese Corner is open to all levels of Chinese speakers, from beginning to advanced. Please contact Cynthia Xu for the Gold Coast group and Niki Zhang for the Nathan group for meeting days, time and venues. TCI also welcomes university students who are interested in Australia-China cultural exchange and language education to apply internships at TCI. Contact us for further information.